Fascinated by robots? You will love our fun robotics camps and classes. Design and customise; build and create; programme and control - our amazing Edison robots work at every level! 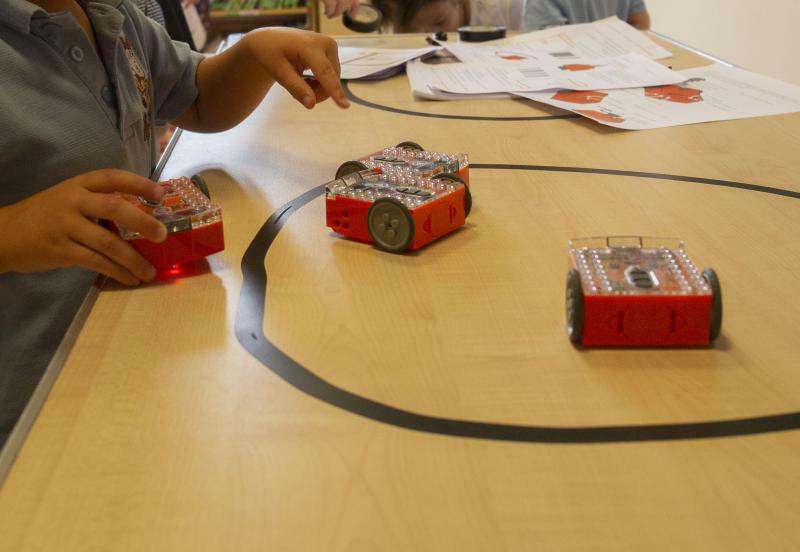 Robotics for kids is a hands-on and fun way for young people to learn STEM concepts in the most engaging way. We run robotics workshops in schools and venues across West Midlands, East Midlands, Cotswolds, Northamptonshire - contact us to find out more about bringing our workshops to your school. 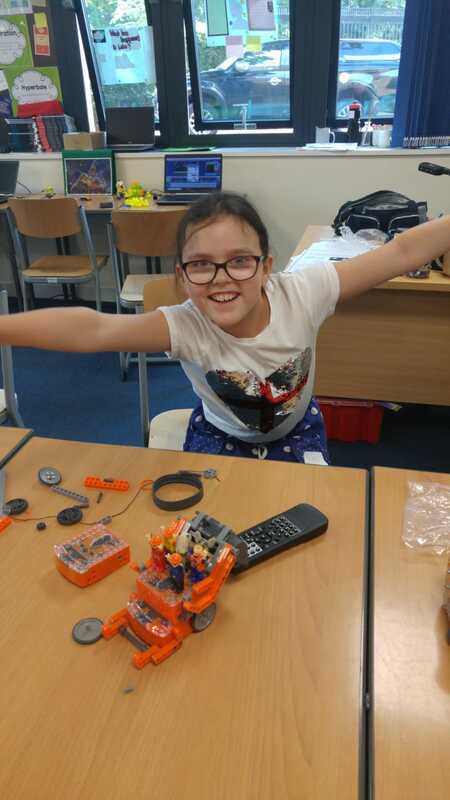 With a range of progressive programming languages everyone can get to grips with robotics in our fun, engaging and educational robotics workshops. Those new to robotics make fast progress using barcodes to programme Edison. Move from there to a block-based programming language, before moving onto real world programming with Python. 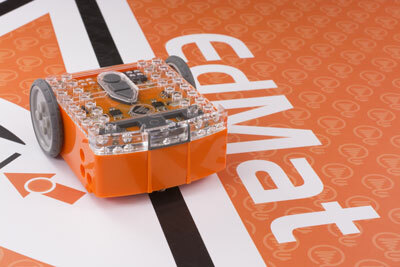 Program your robot to respond to lights and sounds, follow lines and navigate an obstacle course. Build and invent your own engineering projects by incorporating Lego bricks into your robot. Create a remote controlled tank, your own crane or a robotic claw. Design and customise; build and create; programme and control. Your inventions are limited only by your imagination. Robot races, robot challenges, robot wars - STEM fun starts here! Contact us to find out more about Robotics Primary School Workshops or After School Clubs for your school. Robotics and programming can be delivered to specific year groups to suit the needs of your school. To find out more about Robotics camps and activities for your child to attend please contact us. Check out our page on LEGO Robotics and Engineering sessions for more information. Robotics workshops for children with special educational needs or disabilities (SEN / SEND) work well either as part of the core curriculum or as an extra-curricular activity. We would be happy to discuss specific requirements with you. Check out more information about our work with children with additional and special educational needs. Robots carrying out everyday tasks is no longer only the domain of sci-fi films. Robots already carry out a huge range of jobs in manufacturing, investigate hazardous materials keeping people out of harms way, explore new frontiers in space and expand the surgeon's capabilities with robot-assisted surgery. The robotics sector is bursting into our day to day lives and will continue to grow exponentially. "By 2025 robots will perform 25% of all labour tasks"
When it comes to preparing children for the future, digital skills are high on the priority list for future employers. Companies need tech-savvy employees! Demand is set to continue to outstrip supply of skilled workers - and it's not only in the sectors you might imagine - half of all programming openings are in industries outside of technology. Tech City UK estimates that jobs are being created in the digital tech sector at more than twice the rate of other sectors in the economy. Average salaries are 30% higher than the national average. Demand for advanced technological qualifications, such as coding and programming, is predicted to rise by 55% by 2030. Our robotics classes give children the passion to be part of this. Help the next generation be creators of this powerful technology rather than mere consumers of it.